For tea with the girls last Sunday,I baked a scrumptious lasagna(with 8 layers..yes 8..It was a very very rich lasagna!) 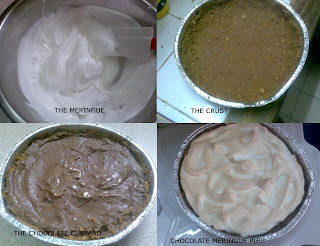 & a chocolate meringue pie.The lasagna of course was a success & they couldn’t stop eating it(I baked my first lasagna when I was 15 years old so I’ve perfected it many times)...hehehe.I’m uber glad that Napisah enjoyed it because like she said,the one at PizzaHut was bad.The chocolate meringue pie was a first attempt by me & it definitely need to be served cold & not straight out of the oven because the crust sort of leaked(cos’ I think I put too much butter in the crust). 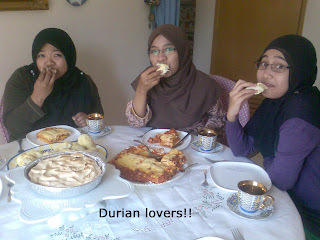 I also served a huge platter of durian that I bought in the morning with a pot of delicious strawberry tea. p/s:I want the new Martha Stewart cookies cookbook!!!!! jessica!! !waduh sudah lama ngak ketemu..hehehee...hows ur students? ?sudah ade yg jatuh hati kat u x? ?